Anyone have one? How does it compare to other billet lowers? And why is it so much cheaper. Cheaper cause it's 6061 instead of 7075. The machining quality seems just as good as anyone. They have a lot of dedicated machines that run automated, round the clock, just building receivers. So I think they are just willing to profit less per part and sell more volume. AND you can get the Arizona Armory (made by sundevil and exactly the same with a kooler roll mark) for $135.00 . but in the long run your better off with a forged lower . Do you use your lower as a hammer ? All it does is hold pins and the tube. The lower to upper adjustment is a big plus to me. When you shoot as much as I do, everything works loose the Sun Devil takes this into account. It's far better than adding an acu-wedge. Trust me. I have several lowers that the only way I can get a tight fit-up any more is with an Acu-Wedge, and they can work themselves loose. Definitely the way to go - Jeff can build a complete upper for practically the same price as a factory forged lower. THE way to go. For a precision rig, can't be touched. I have a few, the only thing I don't like is the sharp edges around the trigger area. Other than that, they are nice looking and well machined. I have 2 of Jeff Covino's Arizona Armory lowers and Jeff is a great guy to deal with and his prices can't be beat . but I still prefer Forged lowers ,even though the Billett looks nicer . my favoritesare Mega and Aero Precision. as far as I can tell the only thing a billet has going for it is looks . what I would realy like to get next is a custom roll mark on an upper . I like my Sun Devil lower, but I still have to use a Accu-wedge. Lots of slop. The upper is a Bravo Co. middy. I helped a friend who built up a Sun Devil lower with an Armalite upper from the Thanksgiving sale last year. The uppper and lower fit was rock solid without any play but no problem getting the pin in. I'm waiting to get his report on how it shoots. Might have to save my pennies to buy a Sun Devil if I can get one this nicely made. Will call Monday. Thanks for the offer. Throwing the flag here. I usually don't, but have to here. If you really had a Sun Devil lower you would know that they have a built in adjustment to take out the slop. So, flag is thrown. I wish the adjustment had came out years ago, because I hate acu-wedges on my match rifles. Throw the flag all you want. Also, I love my Sun Devil lower even with Accu-Wedge. If SD wants to address this issue, fine, if not, I'm still a happy customer and won't bother with it. Sun Devil guy, please advise. If you really had a Sun Devil lower you would know that they have a built in adjustment to take out the slop. So, flag is thrown. You could have found that on the Internet. Please take a picture of it holding today's edition of the Durham Herald-Sun. In all fairness, I believe the gentleman "assumed" I had a Gen 3 lower. Yeah, that's the first thing I thought when I saw that he'd thrown the flag. Lots of Gen.1 and Gen.2 models out there. i have a Gen 2 SD lower. i really like it. LMT upper fits tight, no slop and USGI mags drop free. color match with LMT upper is great, almost perfect. only complaint i have so far is that the finish on the lower is a little soft. doesnt really matter to me, though. scratches give character. Excuse my ignorance but what is the difference? Is there less durability with the 6061? 6061 is a free machining aluminum that is pretty much your standard grade aluminum you would find in a machine shop. It is a bit softer than 7075, so it can dent a little easier than 7075.
either is plenty strong for an AR lower. Just got through putting it together. 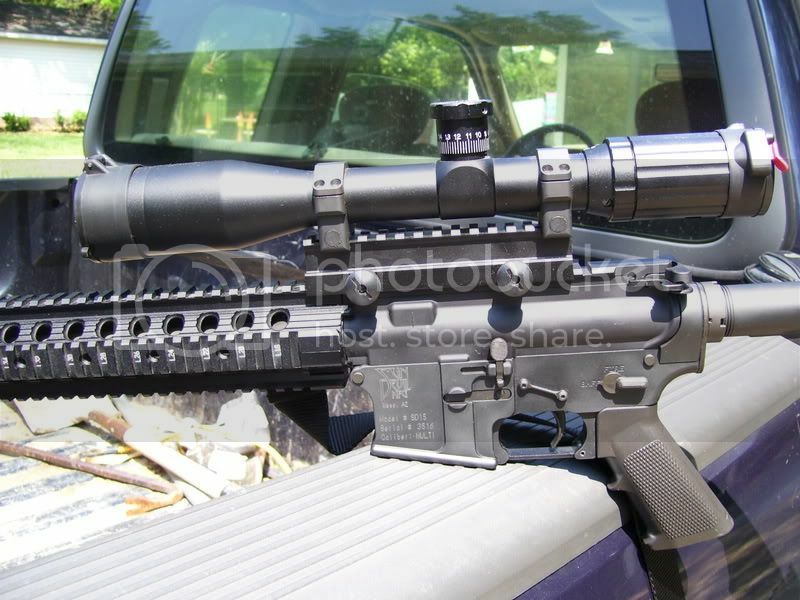 I am not afraid to spend money when i build myself an AR, I want it right and i'm willing to pay for it. If I thought a Sun Devil was in any way inferior to any other lower out there I wouldn't have used one on the most expensive AR I own. I've got one. Pretty nice lower if I say so myself. Very nice, but it would be just a little nicer if there was a little more of a rounded edge around the trigger area. Other than that I love it. I just bought a Sun Devil billet lower and it drops free with GI mags, but will not drop free with PMAGS. Anyone else having this problem? Not with a SDM lower but it happens to me with a LMT rifle and is my understanding that sometimes it happens with the POF lowers too.nothing to worry about IMO. I just got my SD billet lower and looks nice, one thing though I touched it and it looked like the black finish came off slightly with my fingerprints, is this common on all lower finish billet or forged? can you refinish them? havent built it up yet as i am still waiting on my LPK. I have one Sun Devil that I just recently completed as a lower and it is a fine quality piece. I also have another new stripped Sun Devil on the way and plan on purchasing another. I really like them!